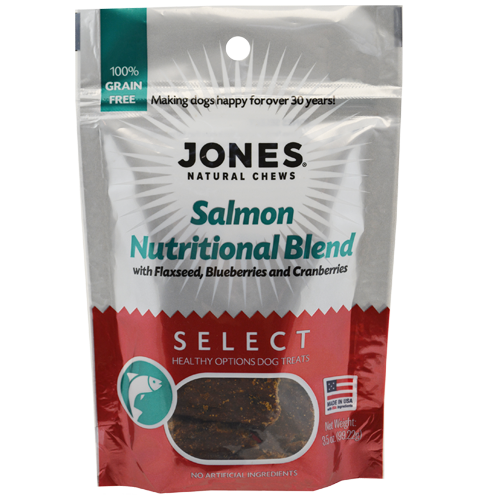 Jones Select Nutritional Blend Salmon contains satisfying salmon blended with some of nature’s most nutritious ingredients, including blueberries, cranberries and flax seed. They’re packed with protein and flavor that dogs crave. Made with the finest natural ingredients, Jones Select Nutritional Blend is a wholesome treat that helps support your dog’s strength, health and well-being. High-quality salmon and highly nutritious ingredients like flax seed, blueberries and cranberries, perfect for dogs who are fed grain-free or raw diets.